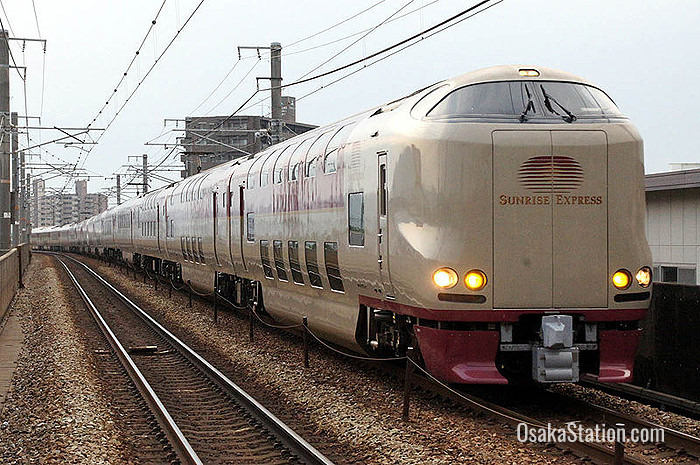 The Sunrise Seto and the Sunrise Izumo are two long distance overnight sleeper trains that are jointly operated by JR Central and JR West. On their outward journey from Tokyo, these two limited express trains are coupled together as one long 14 car train until they reach Okayama. At Okayama Station the two trains are separated into two 7 car trains. Each train then continues on to two different destinations. The Sunrise Seto goes to the city of Takamatsu on the island of Shikoku, and the Sunrise Izumo goes to the city of Izumo in Shimane Prefecture. On the return journey these two trains run separately from their starting points at Takamatsu and Izumo. 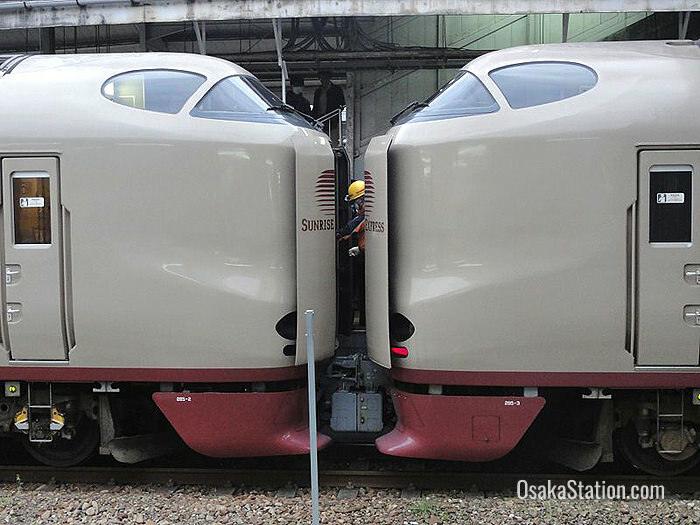 Then on reaching Okayama they are coupled together again until the final stop at Tokyo. 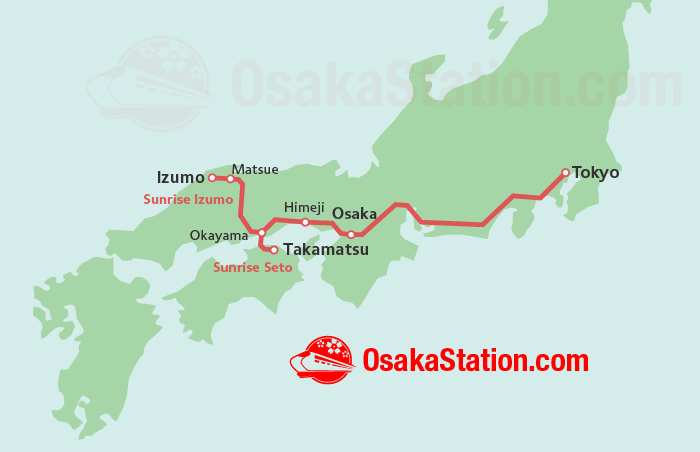 On the outward journey from Tokyo, this coupled train does not stop at Osaka Station, so it is not possible to ride this train between Osaka and the destinations of Takamatsu and Izumo. However, on the return journey, the combined train does stop at Osaka Station. 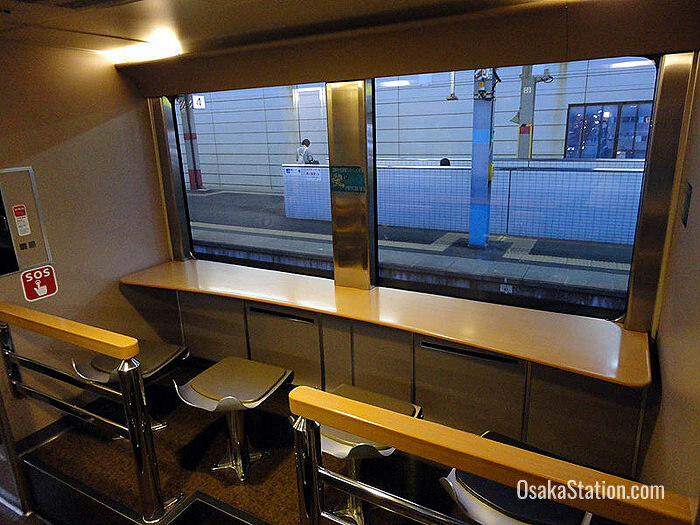 Some reserved seating on this service is also covered by the Japan Rail Pass, so Japan Rail Pass holders can use this sleeper train to travel overnight between Osaka Station and Tokyo Station at no extra cost. The train departs from Osaka Station at 00.34 am and arrives at Tokyo Station at 7.08 am, so taking advantage of this service could save you the cost of a night in a hotel. 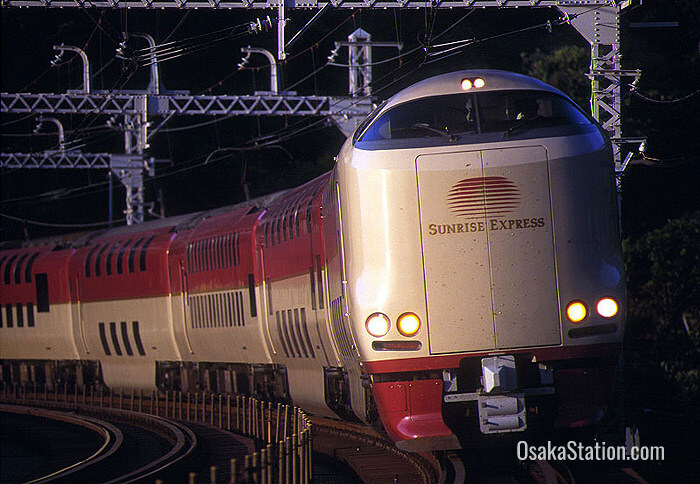 Without a Japan Rail Pass a ticket on this service from Osaka to Tokyo would cost at least 12,180 yen. Advance reservations are mandatory and it is a good idea to book tickets early to avoid disappointment. 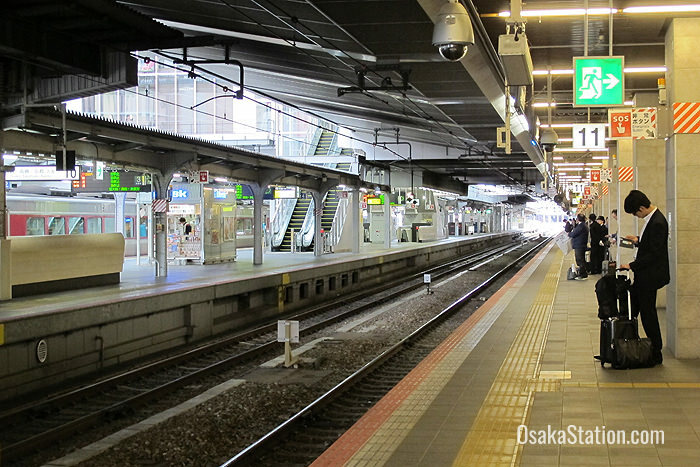 The train departs from Platform #11 at Osaka Station. The train has on board showers, toilets and drinks vending machines. There are also private cabins ranked as single, twin, single deluxe and “Sunrise Twin”. None of the private cabins are covered by the Japan Rail Pass. However, Japan Rail Pass holders can reserve special seats called “nobinobi zaseki” or “stretch-out seats” at no extra cost. 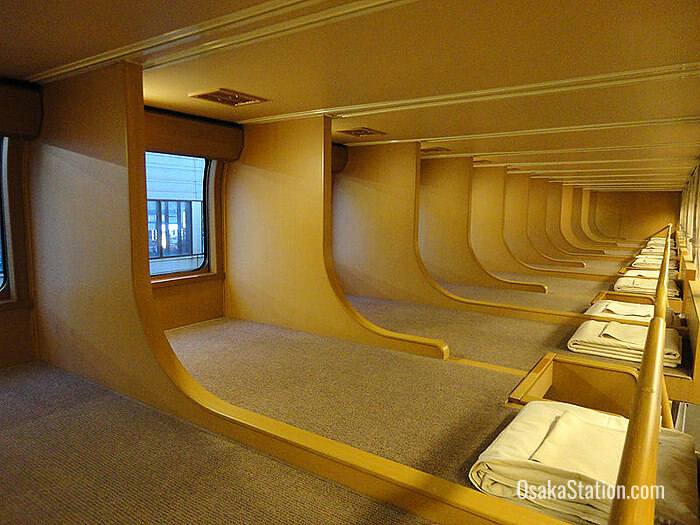 These are semi-private, carpeted sleeping platforms separated by partitions. This is the complete schedule for the outbound and return journeys of the Sunrise Seto and Sunrise Izumo. Please notice that that on the outbound journey from Tokyo the trains do stop at Hamamatsu in Shizuoka Prefecture, but do not stop at Osaka and Sannomiya. On the return journey the trains do stop at Sannomiya and Osaka, but do not stop at Hamamatsu. Once common throughout Japan, this kind of regular sleeper train is now extremely rare. In recent years regular overnight train services have gradually being replaced by luxury overnight “cruise trains” with irregular schedules. The Sunrise Seto and Sunrise Izumo are in fact Japan’s last regularly scheduled sleeper trains in operation, so taking this train is a truly unique experience and one that may not be possible in the near future.